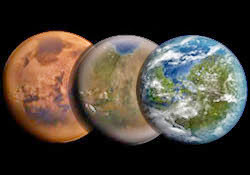 Home » an academic » Experiment » Facts » kids resources » Knowledge » Planet Earth » Planets » Science » Solar System » Space » Technology » What's in the News » Can Mars Support Life Allowing Us to Colonize the Red Planet? Can Mars Support Life Allowing Us to Colonize the Red Planet? Mars is cold, red and dead. Yet once upon a time, it was like Earth, covered with flowing rivers and lakes. Even its day is 24 hours and 37 minutes. But with everyone talking about manned missions to Mars. Could we actually successfully colonize the red planet with humans? There’s plenty of water. It’s been estimated that there are more than 5 million cubic kilometres of water frozen into ice caps at the northern and southern poles. Melt all this down and there would be enough to cover the planet in an ocean 35 metres deep. The water on Mars polar caps could help solve a second problem, finding something to breathe. Mars’s atmosphere is very thin and made almost entirely of carbon dioxide, not the oxygen as humans have adapted to breathe. But, colonists could use electricity to split the H20 in hydrogen and oxygen. Take that oxygen and pump it into air-tight living structures, and now you’ve got somewhere to party! Of course, food would be another barrier. Shipping animals to Mars would be, complicated. So, colonists would need to start as vegetarians. And since plants need sunlight, the fact that Mars is about 1.5 times as far from the sun as Earth is, means they would only receive about half the average solar Irradiance. But scientists have actually experimented with this. In fact, there is a Mars simulation colony in Devon Island, way up in Northern Canada which receives an equivalent solar radiation as Mars. It’s been confirmed that there would not only be enough light to sustain plants on Mars, but that things like tomatoes, carrots and other crops could grow in simulated Martian soil. Of course, growing enough food could actually create so much extra oxygen that it would become a fire hazard. To counteract this, oxygen would have to be diluted with non-reactive gas like nitrogen, which Mars has very little of. Bringing another important things, tools and gas like Nitrogen from home would only add to the cost of the trip. Speaking of bringing things from home, it’s inevitable that at some point a machine or system would break down and require a replacement part. The shortest distance from Earth to Mars is 55 million km, but at times the two planets are on opposite sides of the sun. So, for practical reasons, spacecraft can only be sent to Mars every 26 months. Considering the International Space Station, our longest standing experiment with living in space, needs to be re-supplied every 90 days or so, 2 years and 2 months wait time may be pushing it. Add to that the cost of launching equipment into space, which is around $10,000 per pound, and delivering spare parts becomes a major challenge. Finally, there are threats to human health. Mars is smaller than Earth, and its gravity is only 1/3 what we’re used to, which is awesome for jumping high and creating structures of lighter materials, but not so great for our bodies. We depend on the constant pressure of gravity to build up our bones and muscles. In fact, astronauts must undergo regular exercise in space to keep themselves in shape. But even worse is the cosmic radiation. The sun spews out billions of high-energy particles that can damage our DNA and cause cancer. Luckily, Earth has a powerful magnetic field that deflects 99.9% of these particles. However, Mars has no magnetic field, meaning travelers would be completely unprotected on their journey. On the shortest possible trip, this would raise an individual's risk of developing cancer by more than 3%. Theoretically, none of these problems are completely insurmountable. Perhaps supermagnets could be created to ward of radiation, advanced propulsion systems could reduce the time it takes to get to Mars. We might even develop next-generation 3D printers that could produce spare parts on site from Martian materials. But all of this will require significant advances in technology beyond what we have now. That being said, it is possible that the people who will create this technology have already been born. Maybe it’s you! Will you become a martian? Tell us on the comment box below. Thank you for reading Can Mars Support Life Allowing Us to Colonize the Red Planet? posted on the website Kwentology if you want to redistribute this article please include the link as the source. Have some kuwento to share? Contact us!